Ensure your outdoor cats have fresh water and food available even in the coldest months with the K&H Black Thermo-Kitty Café Heated Bowls. These two, stainless steel bowls easily keep water and wet food thawed, for the delight of your cats or other wildlife. The smaller bowl holds 1.25 cups of wet or dry food, while the larger bowl accommodates 3 cups of water. Each nestles within the hardy, black plastic frame, which fully encloses the 30 Watt heating element. The base of the item flares outward, allowing it to remain stable on a level surface, and the 78" long cord plugs into a standard, 120 Volt outlet for power. A steel spiral around this cord keeps animals from chewing on it, and the two, dishwasher safe bowls may be removed from the frame in moments for thorough cleaning. 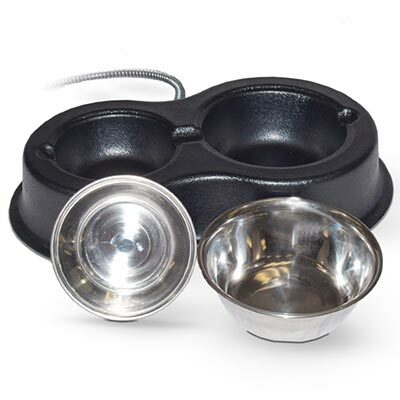 Help your outdoor cats remain hydrated and healthy by using these Black Thermo-Kitty Café Heated Bowls for their food and water. One year limited warranty.